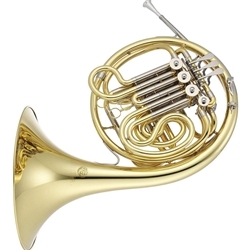 Lacquered Brass Body is produced using state of the art technology to ensure an instrument of the most accurate scale and playability Rose brass leadpipe warms the sound of the instrument and provides enhanced instrument longevity Precision Mechanical-Linked Tapered Rotary Valve combined with open wrap design creates a free blowing and responsive performance experience The JHR1100 double horn possesses the tonal color and transparency well suited for any performance. The Geyer wrap reduces resistance and helps produce remarkable volume. With the many professional features, the JHR1100 will take a student through their collegiate education. Double F/Bb, lacquered brass body, rose brass leadpipe, 4 mechanical-link tapered rotary valves, Geyer wrap, .472” bore, 11.9” bell.